The Dichotomy of Leadership (2018) chronicles the extraordinary experiences of two ex-Navy SEAL commanders. While stationed in Baghdad and Ramadi during the Iraq War, Jocko Willink and Leif Babin collected experiences which helped them become effective leaders. After returning to civilian life, they realized these leadership skills were equally effective in the business world. They figured out that, in both combat and non-combat contexts, you can only overcome the dichotomies of leadership and effectively run an organization by finding a sense of balance between opposing forces. 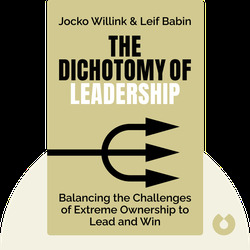 Jocko Willink and Leif Babin are two ex-Navy SEAL officers and co-founders of Echelon Front, a leadership training organization. 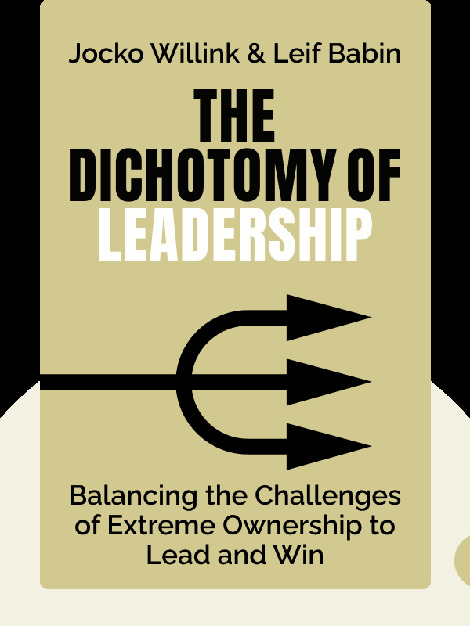 The Dichotomy of Leadership expands and improves upon the principles they set out in their first book, the bestselling Extreme Ownership. Willink also hosts the top-rated podcast Jocko Podcast.